Learning is a different concept for every individual. It is up to the teacher to distinguish the different learning abilities of his/her students and caters to the classroom in order to ensure that the students are learning the core standards for the subject and grade. In this modern society I do not want my students to get wrapped up in reading from a textbook, taking notes on a projector and taking a test then moving onto the next chapter. Although in certain circumstances reading from the textbook and taking notes may be beneficial, but that does not mean that I do not have to incorporate a progressive teaching approach and ideas from the 21stt century skills curriculum. I believe that learning is very much about the way a student can relate the lesson to today’s world, or an outside source. 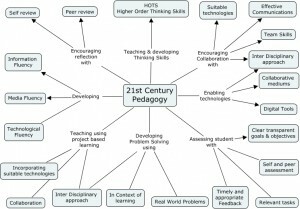 I believe that each lesson should be accompanied by an engaging activity in order to get the students thinking critically about the topic, and that the 21st century pedagogy (above picture) should be enacted in every class! It is important to myself, as a teacher, that my students get the best learning environment. I want to be able to identify different styles of learning and try to incorporate those into everyday class. Whether this is reading from a textbook, creating concept maps, powerpoints, movies, podcasts, smartboard interaction or educational games. I think it’s important to engage the student as much as possible. History and social science classrooms do not need to be as boring as they are often made out to be. Take for example learning about the Constitution of the United States. It would be easy for me to turn to a chapter in the course textbook, have the students read it, copy the vacbulary words and answer the questions at the end of a chapter, but are my students really learning this topic, or just memorizing the vocabulary words and only the answers to the questions in the textbook? Instead I could have the students read the textbook, and then go to the computer lab to create a concept map. After they created their concept map we could use the smartboard to create a mini-lesson (Teacher uses Prezi in History lesson!!) reinforcing the idea of the Constitution while comparing each other’s concept maps and even introducing vocabulary through a fill in the blank smartboard program.. At the end of the lesson I could give them a post-test with SOL based questions to see if they have mastered this concept. This seems a lot more engaging and fulfilling then reading, writing and taking a test. This way the students are learning through a strict traditional approach of reading and lecture but also with a progressive approach of engaging in technology and researching on their own the importance of this document. Of course with every style of learning the teacher needs to be able to make sure that learning is actually occurring and needs to measure the progress of his/her students. In this case, I would want to give pre and post tests on the subject matter, mixed in with those questions I have formulated will also be SOL questions. I would also want to incorporate entrance and exit tickets. I had one teacher in college who used entrance and exit tickets and it really helped to narrow in on what we were supposed to know and take away from the class discussion. This pre and post, entrance and exit tickets would be graded and I would be sure that the students who did not score as high to meet with them and see exactly what their issue was. Did they not understand the subject? Did they not do the homework? I would want to make sure that the pre and post tests, especially with the SOL questions are tracked. This way at the end of a certain period I would test them on the cumulative SOL questions they had been tested on (not the same questions but same material), and then record that progress as well. If certain questions were missed repeatedly then I would want to review that lesson again. Dewey, J. (1938). Experience and eduation. New York: Macmillian Publishing.